ItemH-01525 - Fort Fraser; Completion Of Grand Trunk Pacific Railway Construction. ItemF-06217 - Grand Trunk Pacific Railway construction camp at 129. ItemF-06218 - Grand Trunk Pacific Railway construction camp at 129. 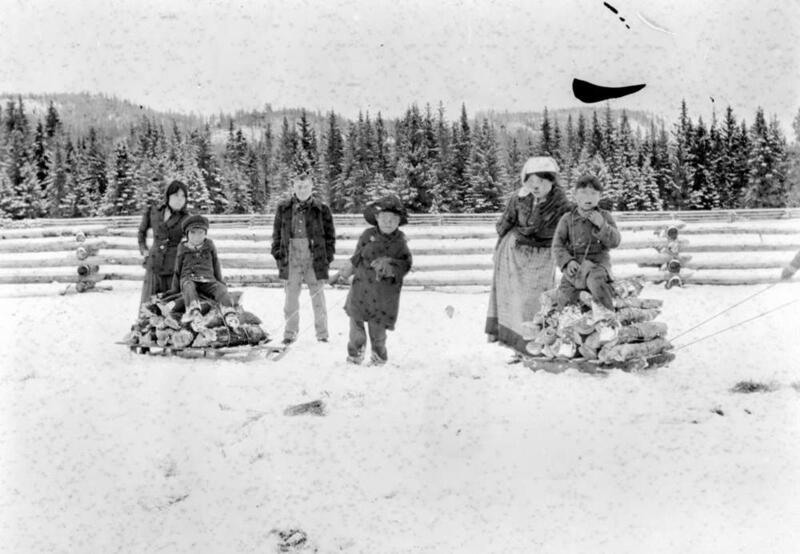 ItemH-04829 - A family collecting fire wood at Fort St. James, BC. ItemD-06443 - Stuart Lake, Fort St. James, BC. ItemD-06444 - Stuart Lake, Fort St. James BC. ItemF-08205 - Preliminary drawing of Victoria City Hall, which also housed the fire department. ItemF-08362 - Freedom of the City of Victoria bestowed on the Honourable W.A.C. Bennett; here, his son Bill is seated at centre. Item H-04829 - A family collecting fire wood at Fort St. James, BC.